François Archanjo grew up on Rio De Janeiro, where 22% of inhabitants live in favelas (slums). He started playing music instruments very early, taught by his father. At 13 years old he started learning percussion in a local social project that supported children of the neighbourhood to not get involved with the drugs and violence through music. After the first lesson he decided that was exactly what he wanted to do. Most youngsters in favelas die before they are 18 years old, he did not want to be one of them and he wanted to help like he was being helped earlier. The AfroReggae Cultural Group is the biggest “Social Project” of Brazil, active in more than 10 cities they give assistance to youngsters teaching percussion, dance, graffiti. After a lot of the work he did as a social worker using percussion as a ”tool”, at 26 years old he was the Cultural director of the DEGASE, Rio De Janeiro’s youth prison system. François now lives in Estonia. TED is a global community, welcoming people from every discipline and culture who seek a deeper understanding of the world. It builds on the belief that ideas have the power to change attitudes, lives and, ultimately, the world. On TED.com, TED is building a clearinghouse of free knowledge from the world's most inspired thinkers — and a community of curious souls to engage with ideas and each other, both online and at TED and TEDx events around the world, all year long. TED is owned by a nonprofit, nonpartisan foundation. TED-s agenda is to make great ideas accessible and spark conversation. 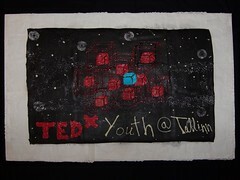 TEDx was created in the spirit of TED's mission, "ideas worth spreading." The program is designed to give communities, organizations and individuals the opportunity to stimulate dialogue through TED-like experiences at the local level. At TEDx events, a screening of TEDTalks videos -- or a combination of live presenters and TEDTalks videos -- sparks deep conversation and connections. TEDx events are fully planned and coordinated independently, on a community-by-community basis. TEDxYouthDay is a series of TEDx events happening all around the world coinciding with Universal Children’s Day in late November. These events are designed to empower and inspire young people. TEDxYouthDay events present a combination of live speakers and TEDTalks to audiences around the world. These events vary widely in size, format, and theme, but they share a common vision: inspiring curiosity, igniting new ideas, and empowering young leaders.